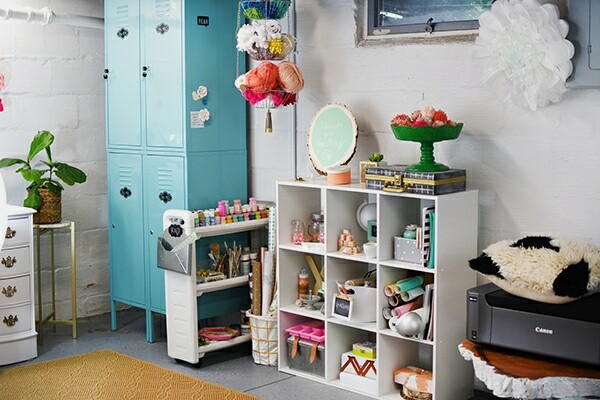 INSIDE : 5 tips on how best to organize your Craft Room or space through evaluating, breaking up the space into uses and containing all your small items! Today is the day! Today is the day! If you’ve been following me on IG stories, you have seen my craft room space has been a work in progress for a while. I typically have everything fairly tidy but over the holidays things got out of control and I never was able to get it back in order. That is until Tauni from Snap Creativity asked me to join in an amazing Craft Room Tour with a group of other talented bloggers. It was just the inspiration I needed to things back on track and I have vowed to never let it get out of hand like that again!! 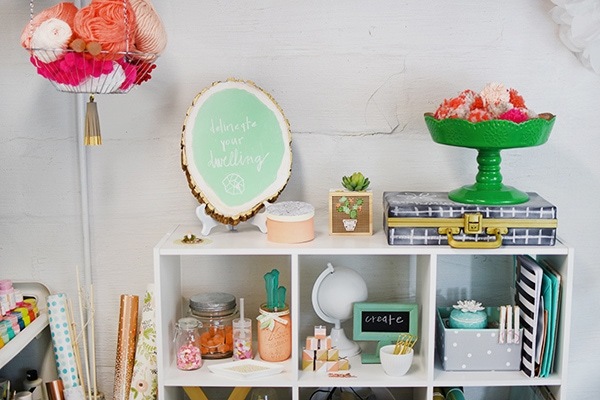 Be sure to read to the end to see all the other inspiring craft rooms. Just to give you an idea of how far I had fallen… here is a TRUE before + after picture. I had to step over a bowling ball set, pom poms, christmas trees, foam core, paint, etc… I took back my space and today will be sharing my tips that I typically implement and now that things under control will continue to do for my craft room. 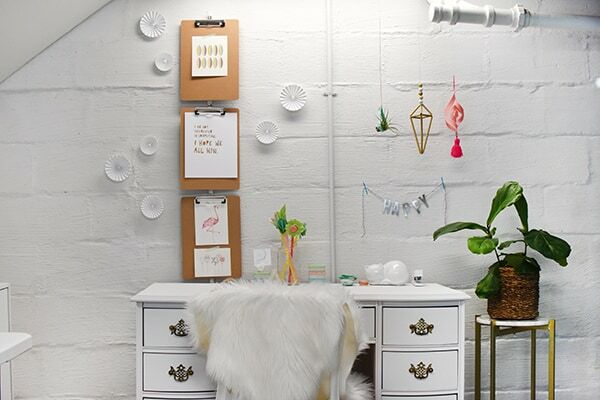 Take a look around your crafting area and the space that you have available to you. In an ideal world, we would all have a whole room set apart just to craft and create in, but often times that is just not possible. In our current rental home, my entire setup is in my basement tucked away in a corner. Just out of view is a sump pump, my laundry area, probably a mouse trap somewhere, etc… It’s not ideal, but I was able to get creative and really have turned that nook into a happy oasis! 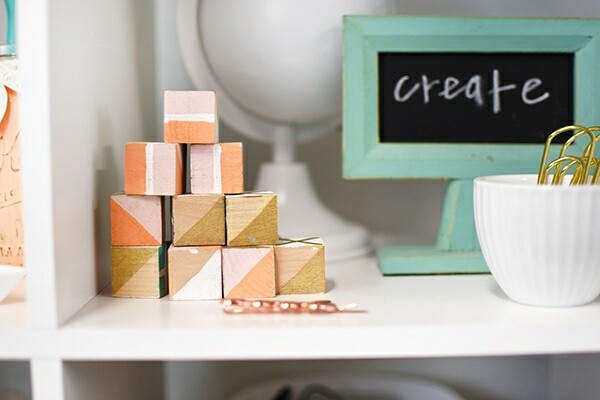 If you have a spare bedroom or a den/office that acts as your craft room, you should have a fairly easy time getting organized, it will just take effort. If you do not, or as in my situation are making the best with what you have, do not fret! 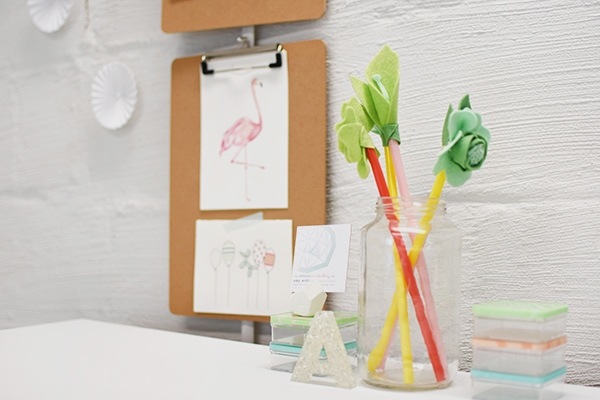 With some creative thinking, you can make your space (big or small) work really well for your needs. 2. Bring in items that make you happy. 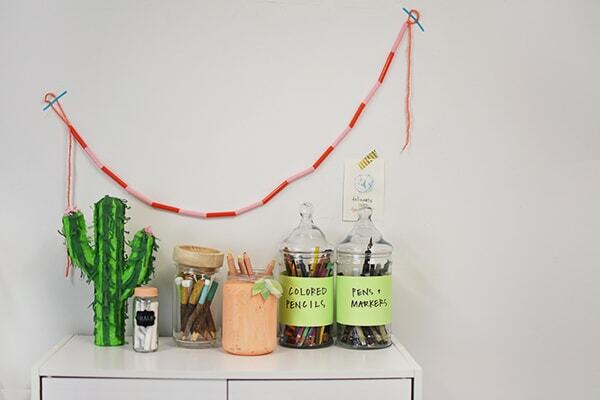 We had an old desk that had been sitting in our garage for years and after a fresh coat of paint, it is a dream for holding spare party banners, streamers, magnets, pens, sparkly clothes pins, etc… Look around your home and get creative with things you can use for organizing. 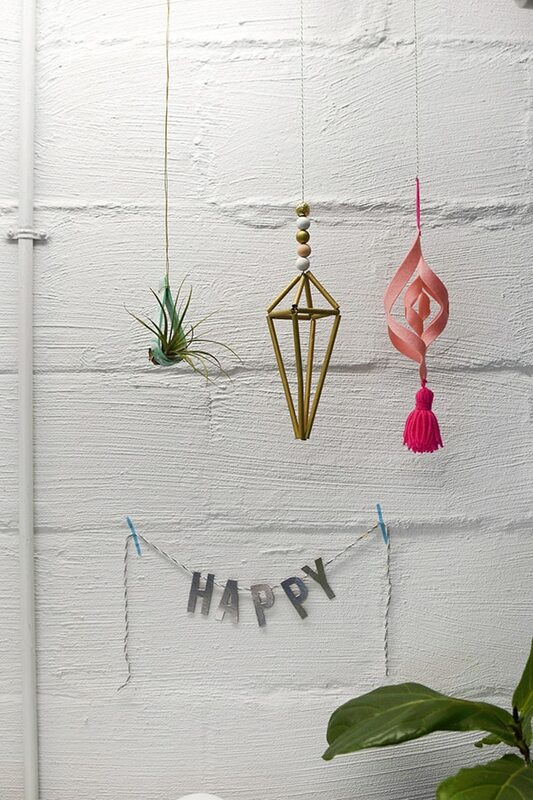 Plants (both potted, hanging and felt), inspirational prints and color all are things that fuel my creative heart. 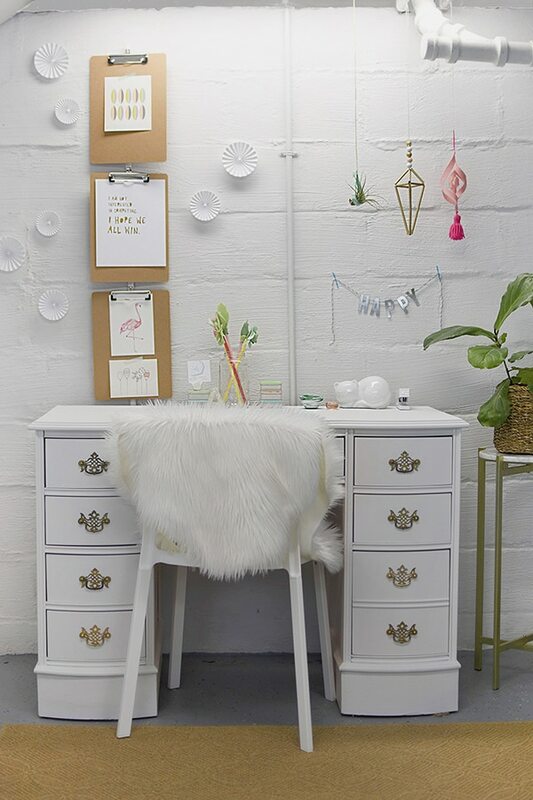 I love keeping my desk area clean and white yet full of cheer. 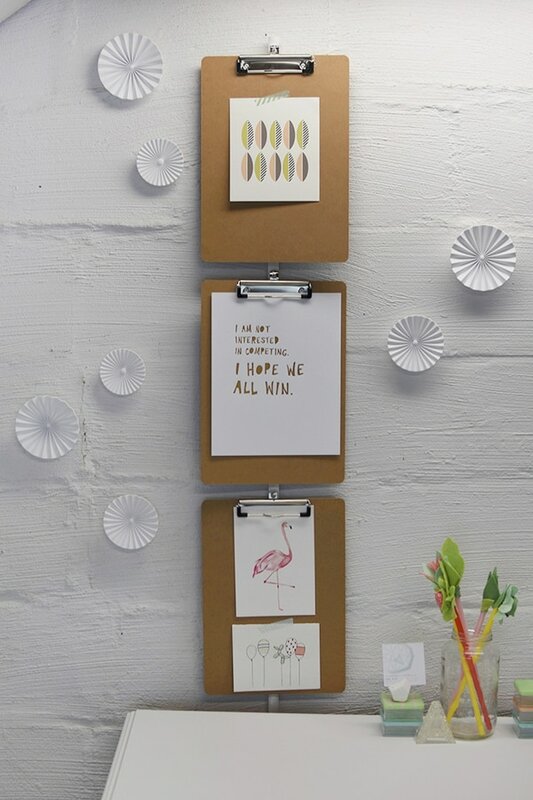 I hung these clipboards in a simple way since we live in a rental. I love being able to switch out the prints and see the color and inspirational quotes always keep me in check. To the right of my main desk, I have a set of two IKEA lockers (similar). 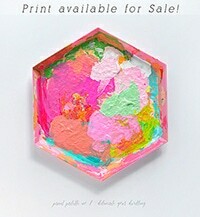 I desperately wish they still sold the type I had bought, as I would love five more! They are deep and hold an enormous amount of crafting supplies. The bulk of my crafting supplies, to be honest are stored in those lockers. With everything hidden from sight in the desk and the lockers, even if things get disorganized, nothing looks like a mess. A simple rolling tiered laundry cart functions perfectly for holding my collection of acrylic paints, watercolors and a large assortment of paint brushes. I use a thrifted hanging fruit basket to store my yarn and stringed pom poms. I love using vertical space to keep tidy! 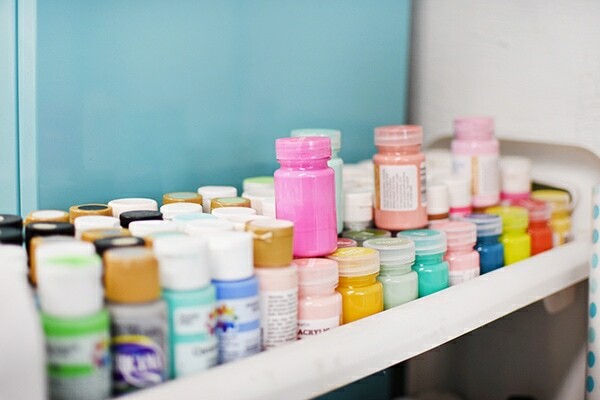 We all have our go-to craft supplies. Be sure before you start giving everything it’s perfect space that you have an idea of your most highly used supplies versus those that are rarely used. Make a list of your basic craft supplies on a piece of a paper and then organize your materials based on those categories. -My desk hold small flat party materials. -My lockers hold MOST everything (glues, ribbons, wooden + raw material items, glitter, etc) and I have them organized very well inside. -My rolling cart holds painting supplies. -My nine cubed shelf holds more of the pretty materials (various confetti, finished products, spare single pom poms, etc). Now, when I need something specific or have to put something back, I know exactly which area of my craft room it belongs. Interested to see how I organize my IKEA Lockers? 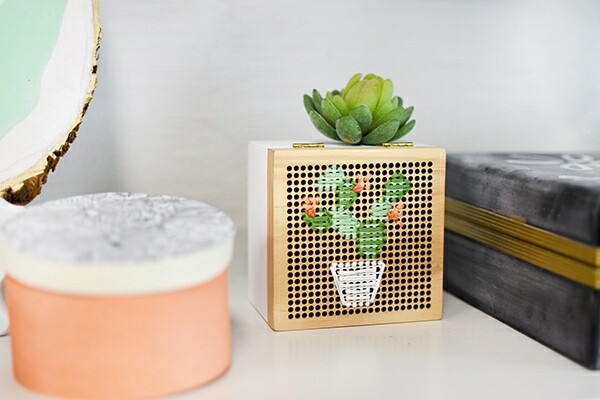 I’ve loved this cubed organizer because I can see the items so clearly, but it does require a little more planning to make and keep it looking pretty and organized. A fun basket doubles as a paper holder. Chalkboard paint transforms an old cassette box into a fun document holder (used to be my son’s memory box). 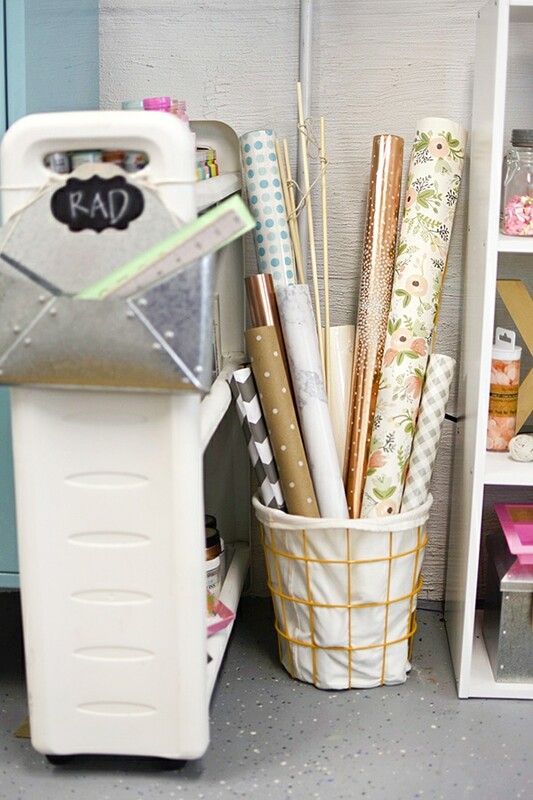 Now that you have your crafting materials and supplies organized and in place, it’s so essential to keep up with your new messes. My crafting area is a direct reflection of how busy I am. It doesn’t have to stay perfectly clean all the time, but before things get out of hand, be sure to take an hour, a day, whatever it is and get everything reorganized. I find my head is clearer and I can be more creative when I am not surrounded by clutter. 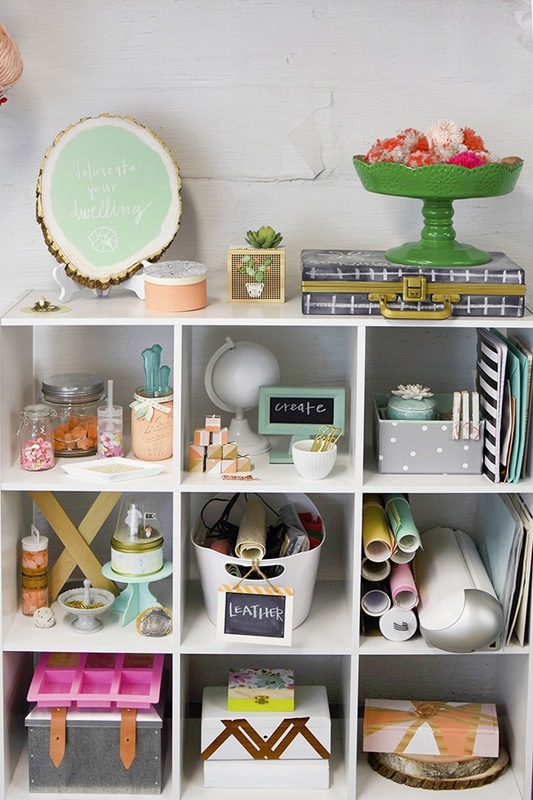 Do you have a great way to organize your crafts that has worked well for you in your home? 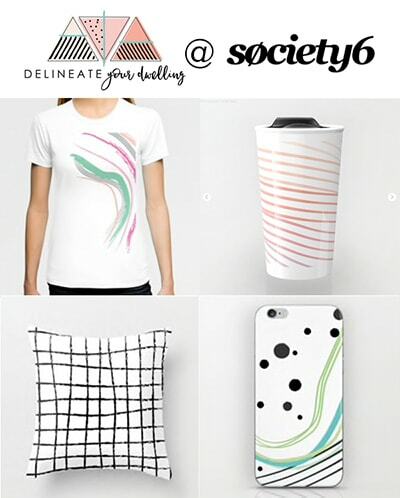 Let me know in the comments, I would love to hear about your idea! 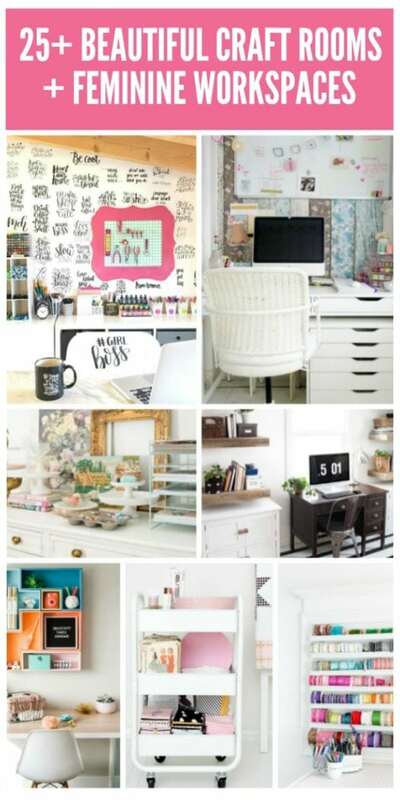 Be sure to click on the images at the very end of this post to see all the other beautiful craft rooms + feminine workspaces. What an absolutely lovely transformation! Totally want those lockers! You did a beautiful job. Thank you so much for the before picture!! Amy, I love this! I would have never known it was in your basement unless you said so. It looks like a trendy flat. I adore the white brick look and the lockers are a really fun touch! I love how much you’ve done with a rental. We rent too and I never know if I’ll have a tiny closet or a big room to dedicate to my workspace…but I always try to make the best of whatever I get. This is seriously goals! Such a fun workspace. Love how the colors in the room are so you! 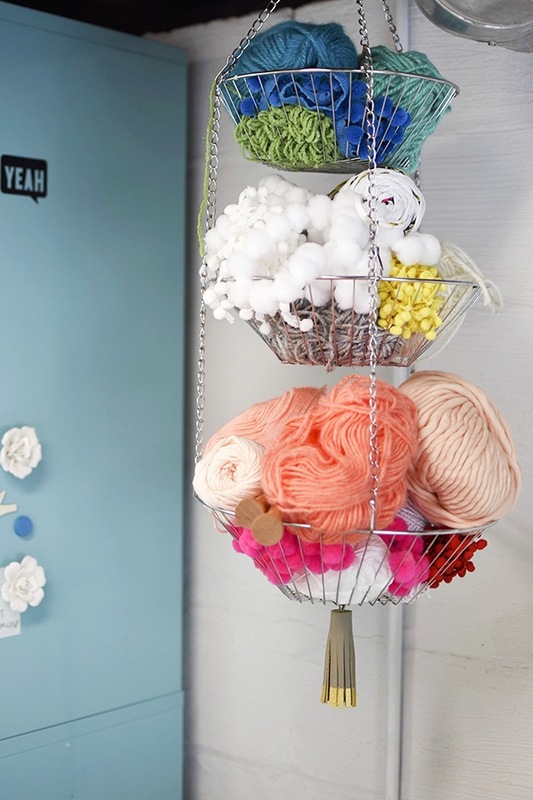 Cute storage idea for the yarn too! I’m swooning over your IKEA lockers. I wanted some SOOOOO bad. Love your space! Honestly, I think it was such a mistake that Ikea doesn’t sell those lockers any longer! They only had them for less than a year. Did you see I included a link to other reasonably priced lockers. Oooooooh so happy! And – I spy figgy! 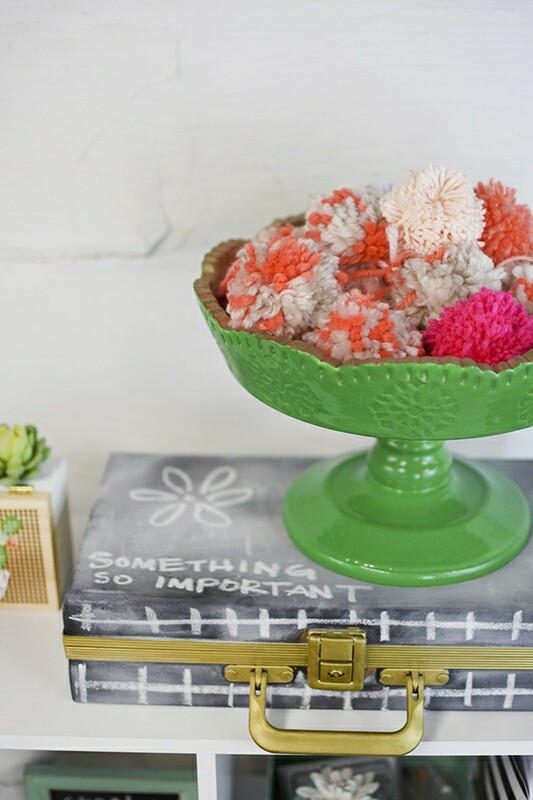 Love all the pretty organization especially the fruit basket for your yarn and pom poms!! Thanks so much! It’s fun to get creative with storage!! Oh MAN, I just saw your Instagram story with the “before” photo blown up and literally laughed out loud…because that is pretty much what my whole apartment looks like 90% of the time! 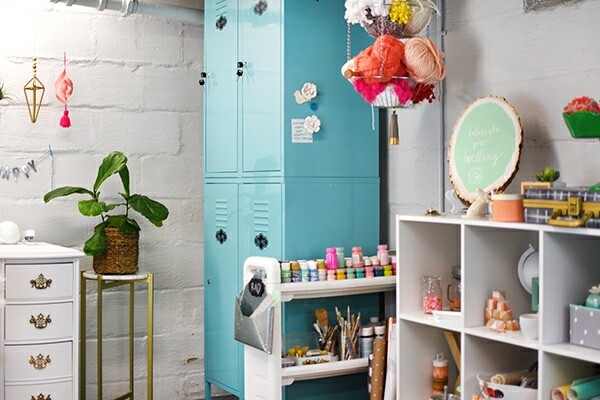 But for real, your basement craft room looks SO cute and organized! I like that you have a mixture of closed and open storage, for me that works well too. I just clicked through to see the inside of the lockers and it is IMPRESSIVE how much stuff you’ve got in there! Love love love seeing your beautiful space! HA! Real life isn’t always as pretty as we would like. And I’ve jammed about 200% MORE stuff in those lockers since I wrote that locker post. I should do an updated post about that… after I organize them. Such a pretty space! The textures that you have in there look so pretty! Thanks for sharing as part of the blog hop! Thank you so much for hosting such a fun blog hop, Tauni!